Following a strategy that mystery writer Agatha Christie would have appreciated, scientists developed a way to examine how antimicrobial peptides (AMPs) behave in an in vivo setting, rather than the usual in vitro setting. To accomplish this feat, the scientists used CRISPR-Cas9 gene editing to systematically knock down AMP genes, going so far as to finally knock down all known AMP genes in an animal model, the fruit fly. This work was intended to have a clarifying effect—and it did, in the style of Christie’s And Then There Were None. Despite their importance in innate immunity, AMPs have remained mysterious. According to some in vitro studies, AMPs can kill bacteria and fungi, but the behavior of AMPs in living organisms is less easily evaluated. One of the reasons is that there are simply too many factors involved in innate immunity, so isolating the effect of individual AMPs in a living organism is a very complex proposition. To reveal what AMPs are up to in vivo, scientists based at École Polytechnique Fédérale de Lausanne (EPFL) made use of the investigative tool known as CRISPR-Cas9. Led by Bruno Lemaitre, a professor at EPFL, they used the gene editing system to delete no less than 14 AMPs from the fruit fly Drosophila. 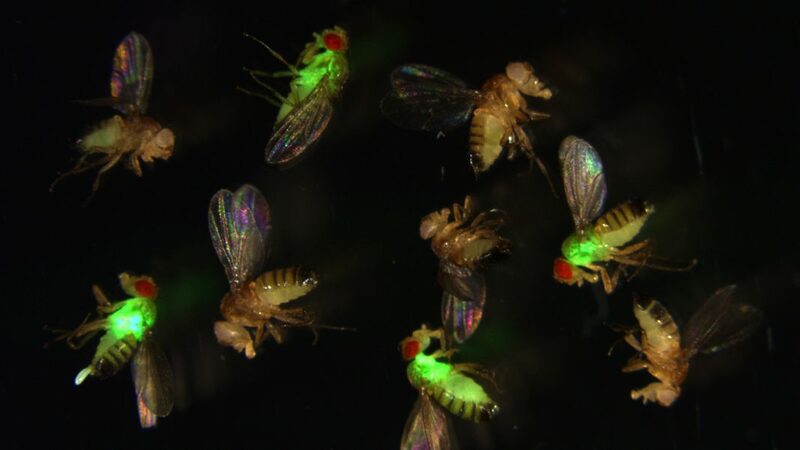 By deleting single AMP genes, various combinations of genes, or even all 14 genes, the scientists were able to remove their corresponding AMPs and observe how their absence affected the fly’s resistance to different bacterial and fungal pathogens. Essentially, the scientists found that the AMPs could work either together or by adding up their individual effects. Surprisingly, they found that certain AMPs can be incredibly specific in defending against certain infections (for example, the AMP diptericin against the pathogen P. rettgeri). This unexpected result highlights a previously unknown level of specificity to the innate immune response.